Yesterday's rally/ride in support of bicycle/pedestrian access on the proposed new Innerbelt Bridge was a success, with a good turnout. You can see more pictures from the event here. There's still more you can do to show your support. 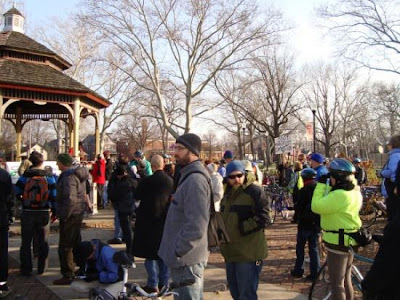 There's a meeting of the Northeast Ohio Areawide Coordinating Agency (NOACA) this Friday, December 11, 2009 at 10:00am. Members of the public may comment for two minutes at the Board meeting of this local planning agency before their review of ODOT's proposal for the new I-90 bridge (sign-in by 9:55am if you intend to comment). You can also send your comments ahead of time to John Hosek at the above address, or by e-mail to jhosek@mpo.noaca.org. Finally, here is an extensive article by Steven Litt, The Plain Dealer's architecture critic, with a few more details on the issue – like a drawing of how a bike lane could co-exist with vehicular lanes and how local engineering firms won’t help because they don’t want to get blackballed by ODOT. Nice.